Uganda is a landlocked country bordered by Sudan, Kenya, the Democratic Republic of Congo, the United Republic of Tanzania and Rwanda. Ugandas population has being growing at an average rate of 2.5 percent per annum, increasing from 12.6 million people in 1985 to 22.2 million in 2000 and projected at 23.4 million by the end of 2002. About 80 percent of the countrys total land area is arable, although it is estimated that only 30 percent is being productively utilized. The vegetation is mainly composed of savannah grasslands, woodlands, bush land and tropical rain forest. More than 75 percent of the country has an equatorial climate that is modified by the high altitude. The southern part of the country receives between 1 000 and 1 500 mm of rainfall and has two rainy seasons annually, while the northern part has a single rainy season and receives between 600 and 1 000 mm of rainfall per annum. The southern parts of Uganda mainly cultivate perennial crops that include coffee and green bananas, while livestock farming is practised in the drier areas of northern and western Uganda. The agricultural sector is composed of both the monetary and non-monetary subsectors. Its share in GDP has declined from 64.1 percent in 1985 to 41.0 percent in 2001. The non-monetary subsector of agriculture has been the most affected declining from 39.9 percent of total GDP in 1985 to 22.7 percent in 2000. Nonetheless, the agricultural sector remains the backbone of Ugandas economy as its main source of livelihood and employment for over 60 percent of the population. It contributes over 70 percent of Ugandas export earnings and provides the bulk of the raw materials for most of the industries that are predominantly agro-based. Agricultural output primarily comes from about 3 million smallholder subsistence farmers, who own an average farmland area of 2.5 ha. The agricultural sector is dominated by the production of food crops, but cash crops, livestock, fishery and forestry are also important. Food crops accounted for 72.4 percent of agricultural GDP in 1985, falling to 65.3 percent in 2000. The main food crop is bananas, which accounted for 28 percent of the total cropped area in 2000, followed by cereals, root crops, pulses and oilseeds with 25 percent, 17 percent, 14 percent and 8 percent of the area, respectively. Despite the dominance of food crop production, only one-third is marketed. Cash crops, livestock, fish and forestry accounted for 4.5 percent, 16.5 percent, 4.0 percent and 2.6 percent of agricultural output in 1985, and 8.9 percent, 6.9 percent, 4.6 percent and 4.3 percent in 2000, respectively. Although Uganda is able to meet its domestic food needs, food products like wheat and rice are imported to cater for the urban population. Ugandas exports are dominated by traditional cash crops such as coffee, cotton, tea and tobacco, with coffee being the principal export crop. However, the share of traditional cash crops in total exports has declined from 96.0 percent in 1985 to 38.3 percent in 2001. This fall is mainly attributed to the collapse of world coffee prices and failure to add value to the cash crops as well as the high dependence on a few export commodities. The contribution to export earnings of non-traditional export products that include fish, maize, hides and skins has increased because of trade liberalization and an aggressive export promotion campaign by government. promote sustainable economic growth by ensuring macroeconomic stability. The modernization of the agricultural sector is one of the major areas of concern for the PEAP. Thus, the Plan for Modernization of Agriculture is aimed at modernizing the agricultural sector through the promotion of a profitable, competitive, sustainable and dynamic agro-industrial sector. This is expected to contribute towards the improvement of incomes by raising farm productivity, increasing the share of agricultural production that is marketed and creating more on-farm and off-farm employment opportunities. Furthermore, it will help speed up diversification of the predominantly agricultural economy by development of the non-agricultural sectors. Trade is viewed as an important stimulus to economic growth and trade policies should contribute to Ugandas poverty reduction efforts, promotion of employment and diversification of exports. In the last 16 years, Ugandas trade policy objectives have been pursued through continuing liberalization with increased involvement of the private sector, deregulation, privatization and participation in regional agreements, particularly the East African Community (EAC) consisting of Uganda, Kenya and the United Republic of Tanzania and COMESA. Other arrangements that Uganda is involved in include the Inter-Governmental Authority for Development (IGAD), which aims, inter alia, to foster economic cooperation and regional food security among member states. Uganda is also a signatory to the Cotonou Agreement, which accords 71 ACP countries preferential trade and links with the EU. It also benefits under AGOA of the United States that offers market access to some 1 800 manufactured products from African countries without restrictions. The liberalization of agricultural marketing and subsequent abolition of price controls and export taxes reduced Ugandas trade barriers. Though this was accompanied by substantial simplification of the tariff structure, the imposition of an import licence commission and a withholding tax on imports raised concern about Ugandas commitment to narrowing the gap between applied and bound rates. Such adjustments could contribute to full exploitation of Ugandas comparative advantages and the attraction of foreign investment. On 29 September 1994, Uganda ratified the Marrakesh Agreement to become an original Member of the WTO, and thus it is now bound by all WTO Multilateral Agreements. Uganda is treated as an LDC within the WTO. It grants MFN treatment to all its trading partners and has made special efforts to establish appropriate machinery to implement the WTO agreements. Despite the difficulties involved in drafting and making notifications as required by the various agreements, Uganda continues to attempt fulfilling all the notification requirements on the basis of their frequency as summarized for those Agreements relevant to agricultural trade in Table 1. Uganda is currently undertaking reforms of all its commercial laws to bring all its trade-related laws, regulations, and procedures into conformity with WTO requirements. An Inter-Institutional Committee, and five Sub-Committees on Agriculture, Services, Implementation and New Issues, Business Malpractices and Legal Framework, and TRIPS and TRIMS have also been put in place to ensure continuous consultation and compliance with its WTO obligations. While Uganda is slowly mainstreaming trade into its development framework, its various institutions dealing with trade policy, including the Ministry of Tourism, Trade and Industry, have insufficient capacity to manage trade arrangements and effectively implement the necessary reforms. All Ugandas agricultural products are bound, although the bound rates differ from one product to another. The bindings are at ceiling rates of 80 percent for most agricultural products, except for 60 tariff lines, with bound rates varying between 40-70 percent, while non-agricultural products including photographic goods, rubber and certain machinery are bound between 40 and 80 percent. Tariffs are the main trade policy instrument used by the Ugandan government, based on the HS nomenclature that was adopted in 1993. An import licence commission of 2 percent and a withholding tax of 4 percent are collected on all imports, which raise the average rates of import duty. In addition, an excise duty of 10 percent is levied on almost all goods (imported or locally produced), with the exception of cigarettes, alcoholic beverages and soft drinks, which are charged 130 percent, 70 percent and 15 percent, respectively. Special protection exists for local sugar and textile industries. A value-added tax of 17 percent applies to most goods whether imported or domestically produced, with the exception of unprocessed agriculture products. Uganda has applied the customs valuation method based on transaction value since July 2000. The adoption of the transaction value led to the elimination of pre-shipment inspection requirements on imports. However, minimum import prices are maintained on used goods, vehicles, textiles, tiles, batteries and safety matches. The 2000/2001 applied tariff schedule has 5 161 lines at the HS six-digit level and three bands: zero, 7 percent and 15 percent, with all tariffs being ad valorem except on fuel. The simple average rate of Ugandas 2000/2001 applied MFN tariff is 9 percent, with a standard deviation of 5.4 percent and coefficient of variation of 0.6, which depicts a moderate dispersion of tariff rates from one category of products to another. The modal rate (the rate occurring most frequently) is 7 percent and applies to 44.3 percent of all tariff lines, while the maximum rate of 15 percent applies to 39.3 percent of all tariff lines. The zero rate applies to 16.4 percent of all tariff lines. Ugandas 2000/2001 applied MFN tariffs generally display negative escalation from first-stage processed goods (average tariff of 10.6 percent) to semi-finished products (average tariff of 8.7 percent), and then positive escalation from semifinished to finished goods (mean tariff rate of 8.8 percent; WTO, 2001). Tariff escalation is positive on the manufacture of foodstuffs, beverages and tobacco, wood and wood products. Further breakdown of the tariff lines (from the ISIC Revision 2, two- to three-digit level) shows a highly pronounced positive escalation of tariffs on petroleum products with average rates ranging from 8.6 percent on the first stage of processed goods to 15 percent on finished products, while for leather products (except footwear and wearing apparel), the average rates range from 7 percent on the first stage to 14.2 percent on finished products. Other categories of products showing positive tariff escalation include wood and wood products, chemicals and pharmaceuticals. The 7 percent rate applies mostly to mineral products, and the 15 percent rate to a wide range of manufactured and agricultural products. Agriculture (including hunting, forestry and fishing) is the most protected sector (ISIC Revision 2 definition) with an average tariff rate of 11.2 percent, followed by manufacturing with 8.9 percent, and mining and quarrying with 8.8 percent. Uganda has abolished most non-tariff restrictions including quantitative restrictions. The remaining few are maintained for moral, health, security and environmental reasons. While automatic licensing is granted for most imports, import approvals are maintained for a few items in a negative list that comprises used tires, firearms, pornographic material, and imports banned under international agreements of which Uganda is a signatory. To import any of the above items, prior authorization must be obtained from the Minister for Tourism, Trade and Industry. Besides, for agrochemical and pharmaceutical products, approval from the Agricultural Chemicals Control Board and the National Drug Authority is required, respectively. The importer must complete a single bill of entry for all regimes, i.e. home use, warehousing, temporary importation, re-importation, and transit. The Uganda Revenue Authority may require supplementary documents at the entry point for the importation of certain goods. For human and animal drug medications, verified pro forma invoices from the Pharmacy Board are needed, a firearms certificate is required for firearms, while a health certificate is required for live animals (domestic and wild). For wild endangered species, permission from the Wildlife Authority is needed, while a fumigation certificate is necessary for second-hand clothing. For seeds and plants, a phytosanitary health certificate is required, while certain food imports require Uganda National Bureau of Standards (UNBS) certification. The Government of Uganda is committed to both EAC and COMESA. EAC is a fast track for COMESA, and the ultimate objective of this regional initiative is the creation of the EAC Customs Union. However, the government of Uganda and its two partners are well aware of the need for the community to be owned by the people of the three member countries. Uganda is a founding member of the Preferential Trade Area (PTA) for Eastern and Southern Africa States, which became COMESA in 1994. Its agenda is to deepen and broaden the integration process among member states through comprehensive trade liberalization measures, the adoption of a CET and a set of standards and technical regulations as well as the free movement of capital, labour and goods within COMESA. COMESA is envisaged to turn progressively into a single customs and monetary union. Its FTA was launched on 31 October 2000. However, only nine of the 20 members, i.e. Djibouti, Egypt, Kenya, Madagascar, Malawi, Mauritius, Sudan, Zambia and Zimbabwe, met this deadline. The CET is to be implemented by 2004. The Monetary Harmonization Program is to be implemented in four phases over the period from 1992 to 2025. The final phase will culminate in a full monetary union, which will imply the adoption of irrevocable fixed exchange rates and a single currency, as well as full harmonization of economic, fiscal and monetary policies by the member states. Several institutions such as the Eastern and Southern African Trade and Development Bank (PTA Bank), the COMESA Clearing-House, the PTA Reinsurance Company, and the COMESA Bankers Association have been established to assist member countries in attaining the COMESA development objectives. The COMESA Treaty also provides for the establishment of a Court of Justice, whose primary function will be to uphold the rule of law in the operation of the Treaty. Uganda grants preferential treatment in the form of duty reductions on imports on a reciprocal basis to other COMESA members, subject to a certificate of origin. Capital goods and raw materials imported from other COMESA countries are duty-free, while intermediate goods and finished goods are subject to a 4 percent and 6 percent tariff, respectively. All goods eligible for preferential tariff treatment must be accompanied by a COMESA Certificate of Origin, authenticated by the authorized signatories in the country of origin. In order to facilitate trade within the region, COMESA members have agreed to implement an Automated System for Customs Data (ASYCUDA) and EUROTRACE. On the 30 November 1993, Uganda, Kenya and the United Republic of Tanzania signed an agreement establishing a Permanent Tripartite Commission for East African Cooperation, currently known as the EAC. The EAC Secretariat was established in March 1996 and has its headquarters in Arusha, the United Republic of Tanzania. The treaty establishing the EAC was signed on 30 November 1999, and came into force on 30 November 2000. The objectives of the EAC include harmonizing tariffs and customs regimes, free movement of people and goods, and improving regional infrastructure. A preferential tariff is intended to prevail within the EAC, and a CET is envisaged by 2004. Since the EAC cooperation agreement was signed, Uganda, Kenya and the United Republic of Tanzania have attempted to harmonize their fiscal and monetary policies and have signed a double taxation arrangement, which also provides for joint measures to prevent tax evasion. Other achievements include pre- and post-budget consultations among the Finance Ministers, synchronization of the budget day in the three countries, regular consultations among the central banks, full convertibility of the three currencies, cooperation in capital and securities regulation, and the creation of common internal passports. In an attempt to boost trade and investment, the East African Business Council has been established, drawing members from national private-sector organizations in the region. Lawyers have also formed their own forum, the East African Law Society. A committee has been established to harmonize laws, including the trade laws of the three countries. The EAC member countries are undertaking joint development of infrastructure projects. Discussions on broadening the membership base, to include Rwanda, Burundi and the Democratic Republic of Congo, are under way. Besides, the EAC leaders continue to hold discussions aimed at harmonizing the EAC with COMESA and the Southern African Development Community. IGAD, which initially was known as the Inter-governmental Authority on Drought and Development, was formed in 1977. Its current member States include Djibouti, Eritrea, Ethiopia, Kenya, Sudan and Uganda. IGADs initial aim was to combat drought and desertification. Its mandate has since been expanded to include new priority areas such as economic cooperation, conflict prevention and resolution. The OAU was founded in 1963 by 32 African nations to promote unity and solidarity among member states. As an OAU member country, Uganda signed the Treaty establishing the African Economic Community (AEC) at Abuja, Nigeria, in 1991. The AEC Treaty came into force in May 1994 when the required numbers of instruments for ratification were deposited with the Secretary-General of the OAU/AEC. The Treaty provides the modalities for establishing the AEC, outlined in six stages, including the removal of tariff and non-tariff barriers to trade, and the creation of a pan-African free-trade area and customs union. A commitment was also made to create an African Common Market, with one central bank and a single currency, over a period of 34 years. The AEC had not started to effectively implement its programmes when it was replaced by the African Union in 2002. Uganda has no specific safeguard legislation corresponding to Article XIX of the GATT, although the government intends to initiate one based on the UR Agreement on Safeguards. Ugandas Customs (Dumping and Subsidies) Act of 1964 provides the current legal framework for anti-dumping and countervailing measures. Reform of this legislation is under way. Subject to a public interest clause, the President may impose an additional duty on dumped or subsidized imports that threaten to cause material injury to an established industry. The Act explicitly requires that such action must be in conformity with the states obligations under the GATT. Though no measures have been taken under these provisions for over five years, Uganda levied a surtax during 1993/1994 on a range of imports such as sugar, mattresses, soap, plastics, etc. from Kenya. No similar special taxes have been levied for this purpose since 1995. Uganda did not schedule any domestic support commitments. Thus, in future, while there is no restriction on Green Box supports or on expenditure on schemes which are exempted for developing countries under the AoA, trade-distorting domestic support cannot exceed the de minimis level. Owing to IMF obligations and budgetary constraints, Uganda provides minimal domestic support to the agriculture sector, and thus it feels that there is no need to calculate and notify WTO in respect of Green Box outlays. Uganda does not offer any subsidies specifically designed to promote exports. Uganda maintains no export duties, except the 1 percent cess collected on coffee exports. The major export incentive is a Fixed Duty Drawback Scheme. The fixed duty drawback scheme operates on input-output coefficients calculated in advance on the basis of information provided by the exporter. Under this mechanism, duties paid on imported inputs (not locally available) that go into the production of exports are refunded so that their export is not rendered uncompetitive as a result of duties. The scheme was established to meet the needs of exporters of agricultural and fishery products that rely on a large quantity of imported inputs, especially packaging materials. The Manufacturing Under Bond Scheme is intended to meet the immediate need of 100 percent export companies. The Commissioner General may permit the receipt into a warehouse of duty-free imports required as components to be so assembled or manufactured therein. For purposes of manufacturing under bond, raw material (input) means any product, processed or not, and output implies substantial transformation leading to changes in the HS Code. The Uganda Export Promotion Board came into being in 1996 following the restructuring and rationalizing of the Uganda Export Promotion Council (1983-1996). The Boards statutory mandate is to promote Ugandas exports in regional and global markets. In a bid to promote exports, the European Investment Bank launched an Export Promotion Fund (EPF) within the Bank of Uganda, at the end of 1995. The loan scheme aims at helping exporters to carry out export promotion activities. This revolving fund is intended to provide interest-free loans (for up to one year) of a maximum of USh5 million for export marketing studies, management and staff training, hiring of sales agents or representatives abroad, and production of promotional materials for the exporting companies. As of February 2001, the EPF had funded six enterprises. As part of Ugandas efforts to create favourable conditions for a market-driven economy, the monopoly of state agencies in the marketing of agricultural products was abolished. The government established regulatory bodies like the Uganda Coffee Development Authority and the Cotton Development Organization to ensure that farmers and exporters maintain quality standards of products and to provide technical backstopping. Uganda has continued with its privatization programme, and almost threequarters of all public enterprises have either been divested or liquidated. As of 31 July 2001, only 74 of the 148 public enterprises slated for divestiture had been sold, and 34 had been either struck off the register of companies or liquidated. Thus, 40 public enterprises await either privatization or liquidation. The most recent privatizations were carried out in telecommunications services and hotels. Further privatizations continue, although some difficulties have been experienced with the process in banking services and electricity. By 2004, government anticipates that privatization will have been completed even in the transportation and utilities sectors. Current Government priorities are the reform of the water, rail and power subsectors. An Infrastructure Country Framework Report initiative is expected to contribute to the development of a more effective and timely utility reform and privatization. However, a considerable amount of work remains in terms of establishing regulatory agencies and implementing privatization transactions. The nature of divestiture has varied tremendously, including public auctions, closed bidding, sale of assets to former private owners, sale of assets to majority shareholders and sale of shares on the stock exchange. The proceeds have been used primarily to meet the termination benefits of workers, payment of debts and the direct costs of preparing the enterprises for privatization. Uganda is currently involved neither as a complainant nor as a defendant in any trade dispute at the WTO. Besides, though it does not have any legislation for regulating unfair trade practices, Government in consultation with the relevant stakeholders is drafting one to this effect. The Uganda Law Reform Commission was purposely established to review all laws, including commercial laws. The eventual commercial laws will be similar to those of Kenya and the United Republic of Tanzania under the framework of the East African Community. Imported food is checked by the UNBS, Customs Department and the Government Chemist. All these base their assessment on scientific and technological regulations and hence do not create unnecessary obstacles to trade. To date, Uganda has not applied any SPS measures against food imports. The Food and Drugs Act of 1959 authorizes UNBS to prohibit the sale and possession of any food unfit for human consumption, as well as false or misleading labelling and advertisement of food and drugs. To this effect, authorized officers may at all reasonable times examine food sold or stored. Increased surveillance has resulted in the discovery of shipments of expired rice, wheat and juice intended for the Ugandan market. UNBS has set up well-equipped laboratories for electrical, chemical, microbiology and building material testing. The microbiology laboratory was accredited to the South African National Accreditation System, while the chemical laboratory is seeking international recognition. Uganda believes that the formulation of national standards and adoption of international standards is very important for its economic development. By September 2001, UNBS had developed, promulgated and gazetted 253 Ugandan standards in the fields of food and agriculture, building materials, electrical items, and chemicals. It has also participated in the development of 207 East African harmonized standards (in various areas) to facilitate trade within the region. UNBS issues, under licence, a standards quality mark known as the Uganda Standards Certification Mark. The mark indicates that the manufacturer is capable of consistently manufacturing a safe and quality product in accordance with either Ugandan or internationally accepted standards. To date, 28 companies have benefited from this scheme, and another 12 are in the pipeline. UNBS is an Enquiry Point notified to the WTO. The necessary infrastructure for this task is being put in place. Currently, a consultant has been engaged by UNBS to ensure that the enquiry point becomes operational using available equipment. There are plans to ensure that all enquiries are answered online. UNBS runs an Information and Documentation Center with information on Uganda standards, British standards and international standards. The Center is also in a position to provide information on the standards of other countries on request through its networking. The Ministry of Agriculture, Animal Industry & Fisheries (MAAIF) has responsibility for three regulatory areas that include phytosanitary controls, matters relating to seeds, and agricultural chemicals and pesticides. To prevent the introduction of infectious diseases, no plant or part of a plant may be imported without a permit from the Ministry of Agriculture, and fresh fruit requires an additional certificate signed by an appropriate government official in the exporting country. Soil is prohibited from entry into the country. Besides, all imports of live animals, plants and seeds are subject to quarantine regulations and can enter only at one of 22 designated ports of entry of customs. Because the UNBS and MAAIF lack adequate funding, government is considering building a strong partnership with the private sector to provide laboratory-testing facilities and to carry out inspections on a contract basis. Ugandan laws governing intellectual property are outdated and not compliant with Ugandas international legal obligations, in particular the WTO Agreement on TRIPS. Government has drafted the Uganda Plant Variety Bill 2002 to replace the old bill. The proposed bill is to bring the country into conformity with the TRIPS Agreement. For its part, Ugandan civil society has substantially examined the procedural provisions of the African Model Law (AML) and the International Convention for the Protection of Plants Varieties (UPOV). Civil society feels that AML is tailored to provide African countries with a model to satisfy the sui generis requirements by taking into consideration their unique circumstances and needs. Its purpose is to strike a healthy balance between the interests of farmers, the largest social segment in the continent, vis-à-vis breeders. Convention grants them a variety of additional rights to reproduction (multiplication), conditioning for purpose of propagation, offering for sale, exporting, importing and stocking for any of these purposes. In addition, they are also entitled to the right to impose on farmers whatever conditions and limitations they may wish. For this reason, the UPOV Convention is not the right instrument for the protection of farmers, since it is not compatible with the ways and means of the majority of Ugandas population. The civil societys conviction is that AML is the best instrument to resort to in order to comply with the requirements of TRIPS without compromising the rights of farmers. This is because Uganda mainly depends on agriculture and stands to benefit most if the legislation on farmers rights is in accordance with AML rather than the UPOV Convention. Besides, Article 9 of the international treaty on Plant Genetic Resources for Food and Agriculture gives farmers the same rights as the AML does. In the view of civil society, the proposed Uganda Plant Variety Bill 2002 is in conformity with the AML for the protection of the rights of the local communities, farmers and breeders. It has benefited from AML in addressing the breeders and farmers rights in a more fair and equitable manner as compared with the UPOV Convention. The bill also takes into account smallholder farmers interests by allowing them to continue their age-old right to exchange, use and sell seeds. The breeders are made to accommodate the needs of farmers, and not vice versa. However, Article 12 of the proposed draft bill that provides for dependent varieties or essentially derived varieties is non-existent in the AML, and as a result, it is borrowed from UPOV. A comparison of the draft bill with the Ugandan national environment statute of 1995 also reveals that the bill is in line with it and complementary to the statute. However, regarding the institutional arrangements, the bill seems incomplete as it mainly relies on government institutions. The bill should also provide institutional modalities for groups and associations of either farmers and/or communities to exercise their rights and discharge responsibilities emanating from its provisions. In a bid to effectively implement TRIPS-related WTO agreements, an Inter-Institutional Committee (IIC) with five subcommittees on TRIPS was established to coordinate national trade policy. Members of the task force include representatives from Government, interested business enterprises and civil society. The five committees handle issues of interest to publishers, writers, economic researchers, broadcasters, performers, composers, manufacturers, investors, artists, researchers, pharmacists and herbalists, as well as the administration of justice and law enforcement agencies. The IIC has received technical assistance provided under JITAP Cluster 2 for capacity-building and holding regional workshops to train specialized trainers on TRIPS. Technical assistance has also been provided to enhance legislation drafting to WTO requirements as well as strengthening institutional capacity in the implementation of SPS. Over the past decade, Ugandas real GDP has grown at an average rate of 6 percent per annum. Fiscal deficits (including grants) have been contained below 3 percent of GDP and inflation (measured by changes in consumer prices) dropped from 32 percent in 1990/1991 to 8 percent in 1994/1995 and 3.5 percent in 1999/2002. Despite positive results recorded through the relative stability in domestic prices, the Bank of Uganda has continued to implement a tight monetary policy. Tax administration is being restructured, albeit with some delay. Following the adoption of the PEAP, public expenditures have been redirected towards poverty reduction and infrastructure development projects. Ugandas gross international reserves increased to cover about five months of prospective merchandise imports. Ugandas economic performance has made it eligible for the HIPC initiative. However, owing to its poor export performance and delays in the realization of savings from the Enhanced IMF/World Banks HIPC initiative, debt ratios worsened in 1999/2000. The stock of Ugandas external debt was estimated at US$3.68 billion as of June 2000. Traditionally, Uganda runs a current account deficit on its trade and services accounts. In the last few years, the deterioration in Ugandas external terms of trade has contributed to a decline in export earnings, from 11.2 percent of GDP in 1994/1995 to 7.9 percent in 1999/2000. Imports, however, have increased, widening the trade balance. 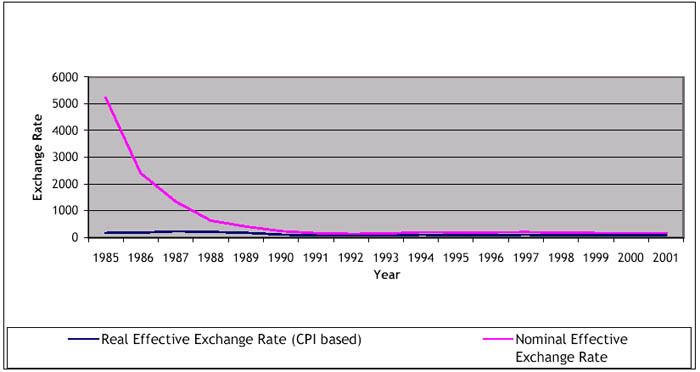 In a bid to improve the competitiveness of exports, Uganda adopted a marketdetermined foreign exchange regime in the early 1990s, narrowing the gap between the nominal and real exchange rates, as shown in Figure 1. Despite the improvement in Ugandas real exchange rate, the response of Ugandas exports has been sluggish mainly because of supply-related bottlenecks. Figure 1. Ugandas nominal and real exchange rates. Over the period 1985-2000, Ugandas total agricultural exports have exceeded its total agricultural imports, resulting in a net export surplus as in Table 2. The trend in the balance of trade over time is shown in Figure 2. A review of the growth of agricultural exports relative to agricultural imports by period reveals that only in 1990-1994 did export growth exceed import growth, while in the other two periods, the reverse happened. The net agricultural export balance peaked at US$29.8 million in 1985-1989, then dropped to US$17.5 million in 1990-1994 but rose later to US$28.2 million in 1995-2000. The share of agricultural imports to agricultural exports has grown from 10 percent in 1985-1989 to 31 percent in 1995-2000. This persistent growth of agricultural imports, as compared with agricultural exports, could worsen Ugandas trade position over time. Figure 2. Ugandas agricultural trade. 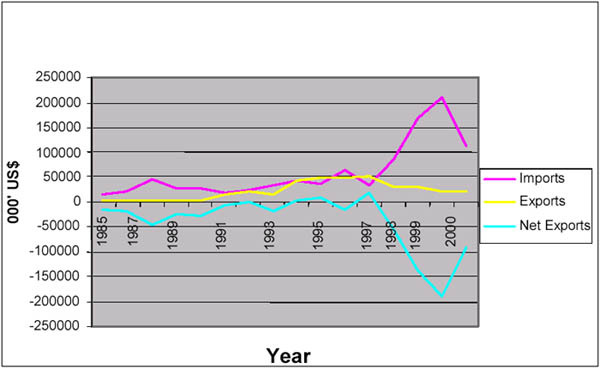 Source: FAO Statistical Databases, FAOSTAT 2001. aThe period growth rates have been calculated from annual data using the Linest formula in Excel. Ugandas food exports are smaller than its food imports, which explains the net food deficit between 1985 and 2000. Food imports constituted 77-87 percent of the total agricultural imports over the years 1985-2000. This high proportion of food imports is attributed to the increased investment in food processing industries that use refined sugar and the rising urban population that mainly consumes wheat and rice. Food exports as a percentage of total agricultural exports were 0.2 percent in 1985-1989, peaked at 13 percent in 1990-1994 and dropped to 8.2 percent in the period 1995-2000. This small contribution of food exports to total agricultural exports is partially attributable to the dominance of subsistence agricultural farming and the continued exportation of food items with little value added. A review of food imports and exports reveals that while the former manifested a positive growth trend between 1985 and 2000, the latter first increased from 10.8 percent to 31.1 percent in 1985-1994 and then dropped to -18.7 percent in 1995-2000, as shown in Figure 3. Ugandas non-food agricultural imports consist of tallow and machinery, while non-food agricultural exports include cotton, tobacco, cotton seed cake, floricultural products, and hides and skins. Figure 3. Ugandas food trade. Ugandas agriculture sector still accounts for over 70 percent of its exports. These exports are mainly dominated by coffee, as shown in Table 3. Uganda ranks ninth in the world (accounting for 3 percent of the worlds coffee production) and is second in Africa to Côte dIvoire. Coffee provides employment to approximately five million Ugandans, either directly or indirectly. Smallholder farmers produce 99 percent of total coffee output. 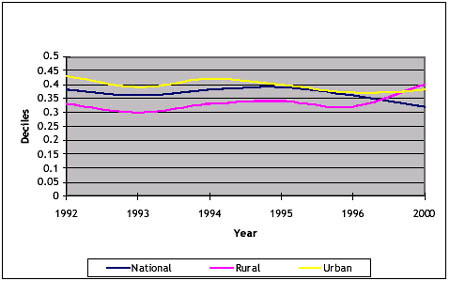 Source: FAO Statistical Databases, FAOSTAT 2001. In the period 1990-1994, coffee registered a decline in both price and quantity, but in the subsequent period (1995-2000), the decline was reversed. The instability in coffee export earnings is attributed to fluctuations in international coffee prices and the ravaging of farms by coffee wilt disease. Besides, the failure to add value on coffee exports through processing has resulted in the continued loss of Ugandas international market share to other competitors. This phenomenon underscores the need for commodity-exporting LDCs like Uganda to capture a larger share of the international market through value addition. Uganda still has a comparative advantage in coffee production. This explains why the Government continues to focus its efforts on coffee as one of the prime agricultural subsectors that can have a major impact on poverty eradication. Indeed, coffee rejuvenation is an important part of the governments poverty reduction strategy (Poverty Action Fund). The Government for the first time has allocated USh500 million in 1999/2000 for new planting and is expected to continue with this support for at least two more years. The National Agricultural Research Organization has intensified research on the coffee wilt disease that poses a threat to the coffee sector. The Government also wants to add value to coffee and is looking for investment partners, although this may be difficult to attain since the investment needed is heavy. Cotton has experienced an upward growth trend in output over the period 1985-2000, although instabilities were registered in its price. These variations in cotton export earnings are mainly attributable to fluctuations in international cotton prices, political instability in major growing areas as well as a heavy dependence on weather. However, Government is committed to reviving the cotton industry because it is the second most important cash crop in Uganda. The cotton industry (including textiles) employs 1.4 million people including farmers, ginners, textile workers, middlemen, oil millers, transporters and exporters. Besides, Ugandan cotton is generally of a high quality and enjoys a comparative advantage in the region. Tobacco as a significant contributor to Ugandas export earnings has been registering steady annual growth in both price and volume since 1985. However, cocoa has been experiencing mixed fortunes, recording a decline in its price, although the quantity has been on the increase. Among the more significant Ugandan non-traditional exports in recent years are fish products, maize, beans, horticultural products, oilseeds, and fixed vegetable fats and oils. The value of these products averaged US$87.4 million per year during 1995-1999, which represented 18.6 percent of agricultural exports and 15.1 percent of total national exports. The trend towards some export diversification appears to have benefited from the past devaluation of the shilling encouraging the recovery of export crop production and, more fundamentally, regional trade liberalization under COMESA. Ugandas major food exports are maize, beans, pulses, fruits and oil seeds, as shown in Table 4. Food exports, particularly maize and beans, are mainly exported through formal and informal cross-border trade and through international aid agencies. International agencies (especially WFP, EU and IRCC) procure food to deliver to displaced people as well as relief supplies for neighbouring countries. Formal cross-border trade involves the use of export licences and certificates. There are few data available on informal cross-border trade, which usually involves quantities of less than US$1 000 in value. The decline in maize earnings in the period 1990-2000 is mainly attributable to a fall in output as price remained constant. Pulse earnings have steadily increased in the period 1990-2000 owing to a rise in both price and output. Since 1985, export earnings from fruits and vegetables have been growing steadily. This is due solely to increased output exported, as this was not accompanied by a price rise. Fruit and vegetable exports earned Uganda US$8 million and US$13 million in 1990-1994 and 1995-2000, respectively. The primary markets for Ugandas fruits and vegetables are the United Kingdom, Belgium and Sweden. Bananas are the most abundantly cultivated food crop in Uganda. Annual production is estimated at 8.5 million tonnes, accounting for 15 percent of the worlds production. However, banana production is primarily for domestic consumption. In addition to providing food, bananas are a source of income to farmers throughout the year. Total forest estates cover about 14 percent of Ugandas land area, of which state forest represents 50 percent of the total. Domestic supplies constitute about 95 percent of Ugandas timber requirements. Forestry accounts for about 6 percent of Ugandas GDP. The major timber products for export include veneers, lumber, poles and furniture items made of mahogany and other hardwoods such as mvule, elgon olive and nkoba. As part of the governments strategy to encourage valueadded products, the exportation of raw timber is prohibited. Livestock accounts for 17 percent of agricultural production and contributes about 9 percent of Ugandas GDP. It has expanded steadily, growing at an estimated rate of 2.2 percent per annum. Dairy cattle contribute most of the growth, with potential in beef cattle, poultry, sheep, goats and pigs remaining largely unexploited. Uganda is endowed with plentiful freshwater bodies comprising natural lakes and rivers, which cover about 18 percent of Ugandas land area. The largest and most productive water bodies are Lakes Victoria, Kyoga, Albert, Edward and George. The major fish produced is Nile Perch. The average fish harvest totals 235 000 tonnes annually. Fish exports contributed 40 percent of the total value of Ugandas non-traditional exports by the end of 1998. However, beginning March 1999, the fisheries subsector faced setbacks as a result of fish poisoning that led to a ban on fish exports to the EU that lasted 18 months. However, exports are now recovering, and fish export is expected to increase by 73 percent in 2000/2001. There is sufficient room for expanding catch and exports through the development of aquaculture and provision for high-yield and quick-maturing fish fry. Floriculture is still a relatively new subsector, which started in 1993. The subsector expanded from one farm in 1993 to 20 farms with 75 ha by 1998. The rapid investment in floriculture is attributed to the linkage of Uganda exporters with Dutch trading houses as well as the competitive edge Ugandan flowers have over other producers in ten different markets. Table 5 shows that expenditures on food imports have grown steadily over the period 1985-2000. Wheat and rice imports increased significantly in 1995-2000 as compared with 1990-1994, although prices remained steady. Expenditure on sugar imports reflects a similar trend with significant volumes registered in the same period, although accompanied by a price rise. Expenditure on maize imports have been rising as a result of increased import volumes, rather than price changes. 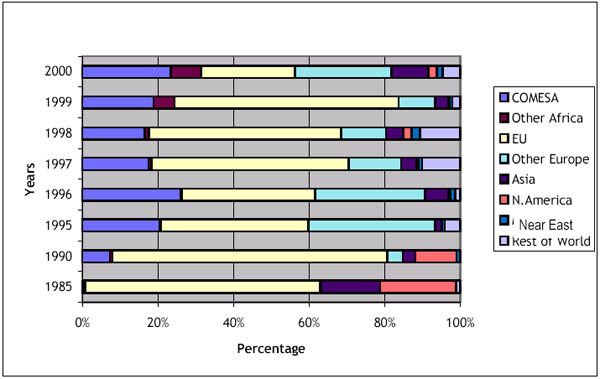 It should be pointed out that wheat and rice are mainly consumed by the urban population. Information on market access conditions, as measured by simple average tariff rates, was applied to products of export interest to Uganda excluding and including preferences, as shown in Table 6. The preferential rates that were used are those extended to Uganda such as the GSP. The results reflect the fact that Ugandas exports globally have a better market access in the developed country markets because of preferential trade arrangements. Uganda is among the 70 ACP states granted non-reciprocal preferences by the EU under the Lomé Convention (now the Cotonou Agreement). All Ugandan exports, except those covered by the Common Agricultural Policy, enter the EU market free of customs duties and quantitative restrictions. Uganda also qualifies for GSP treatment in major developed markets including the United States, Japan and Canada. 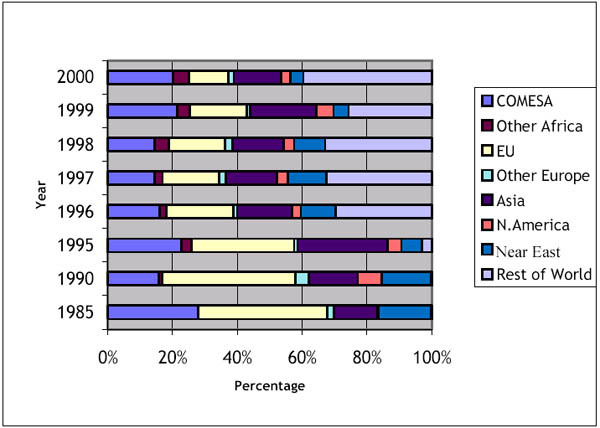 Until recently (1999), about half of Ugandas exports were taken by the EU (Figure 4). The United Kingdom is the largest single destination for Ugandan exports. Since 1995, there has been a significant increase in exports to Asia and Africa. COMESA, in particular Kenya and the United Republic of Tanzania, is also rapidly becoming a major export market for Ugandas exports, owing to the recent increase in non-traditional exports. Up to 1995, the EU was Ugandas single most important source of imports, but since then, its share has been decreasing, as shown in Figure 5. From 1996 to 2000, imports from other European states, Asia and COMESA have grown rapidly. Kenya is the largest single supplier, accounting for nearly one-quarter of total merchandise imports to Uganda. Figure 4. Destinations of Ugandas exports by region. Figure 5. Origin of imports by region. The Fisheries Resources Department of the Ministry of Agriculture, Animal Industry and Fisheries is charged with issuing of licences for industrial fish processing, commercial fish farming and boat building. There are 11 registered fish exporters that mainly export fish products to the European market. Sanitary and phytosanitary problems of 1998 were raised primarily by the EU because of incidents of fish poisoning and reports of unhygienic conditions at landing sites, which affected exports, although the ban was lifted in 2000. This incident also led to a temporary suspension of issuing of new licences for industrial fish processing. Uganda sought assistance from the EU to improve fish handling. Veterinary experts from the EU worked with Ugandan officials to rectify the handling of fish right from the lakes, fish-processing factories and prior to export. Assistance was also extended to the fisheries department to improve fish inspection and surveillance. Laboratories have been put in place to enhance continuous assessment of fish quality in Uganda. Uganda adopted a new incentive regime of investment capital allowances to replace the tax holiday facility embodied in Section 14 of the Finance Statute 1997. The new incentives fall into three categories: capital allowances and expenses, deductible annual allowances and annual depreciation allowances. For regional development purposes, incentives for investments established outside the Kampala area are now greater than those in Kampala. Licensed investors enjoy a deferred value added tax (VAT) payment facility on plant, machinery and raw material for drugs, seedlings, greenhouse equipment, plastic sleeves and tea clones. The facility is granted on a consignment basis, as approved by the Commissioner for VAT. In addition, the Budget for the 2000/2001 financial year provided VAT exemption to producers of all types of agricultural inputs, waived customs tariffs on some imported raw materials, import licence commission and the withholding tax on all imported raw materials. Uganda has been attracting increasing amounts of foreign direct investment (FDI) since the beginning of the 1990s. Between 1987 and 1993, Uganda attracted an annual average of US$9 million of FDI. These inflows have increased steadily since 1994 to a peak of US$222.1 million in 1999, as shown in Table 7. Uganda attracts more FDI than any other country in the Great Lakes region, although the inflow is still low in relation to the economys needs. Source: Based on UNCTAD FDI/TNC database, IMF (2000), BOP Statistics Yearbook, 2000. Foreigners have mainly invested in manufacturing (about 52 percent of the total FDI over the period 1991-1998). Other areas of interest to foreign investors include transportation, communication, storage, real estate, agriculture, forestry and fishing, as shown in Table 8. Source: UNCTAD, based on information provided by the Uganda Investment Authority. Mirroring their importance as trade partners, the EU, United States, Canada and increasingly the COMESA countries are Ugandas leading foreign investors. Starting from very low levels, commitments have picked up, reflecting confidence in the countrys economic management, the abolition of restrictive approval procedures and possibly the pull effects of incentives. The leading investor countries in Uganda include the United Kingdom, Canada, Kenya, the United States, South Africa and India. These countries together account for more than half of accumulated FDI inflows to Uganda over the period 1991-1999, as shown in Table 9. There is still regional investment interest from Kenyan companies as well as from other traditional sources. Other countries in Europe have also expressed greater interest in Uganda, according to the Uganda Investment Authority. a FDI figures in this table represent approved amounts, only some of which have been actually invested. Source: UNCTAD, Uganda Investment Authority. Uganda has been referred to as potentially the bread basket of Africa. Although Ugandas population growth has exceeded its food growth rate in recent years, to a large extent, it has been able to feed its population. A large proportion of the population can afford to produce enough food to meet their own food needs. Uganda consumes most of the food it produces, with exports being less than 7 percent of food production. Imports of food are mainly wheat and rice, which account for less than 5 percent of total food requirements, and these food products are mainly consumed by urban dwellers. Table 10 shows that food production grew much more rapidly in the 1980s than during 1991-1996, a period that witnessed the highest population growth. This implies that for Uganda to restore per capita food production to the levels of 1981-1990, it is essential to reduce population growth from the current 2.5 percent per annum, while at the same time boosting food production. If the population continues to grow unabated for the next 15 years without a corresponding increase in food production, it will definitely increase the percentage of Ugandans who are food insecure. Source: FAO Production Yearbook, 1997. Calculations from the FAO balance sheets indicate that, on average, Ugandans were consuming 2 288 kcal daily in 1989-1991 and 2 185 kcal in 1997-1999, as shown in Table 11. Apart from 1989-1994, when energy consumption was above 2 200 kcal, in the period 1995-1999, Ugandans were consuming below the minimum requirement of 2 200-2 300 kcal per capita daily. This was even more acute for the approximately 20 percent of impoverished households whose food consumptions fell below the minimal nutritional requirements. Source: FAO Balance Sheets 1997, FAOSTAT 2001. Table 12 shows that cereals, followed by coarse grains, dominate the food aid that Uganda received between 1985 and 2000. Food aid was highest in the period 1990-1994 with 142 224 tonnes, but later dropped to 125 174 tonnes in 1995-2000. The United States and the EU are Ugandas major sources of food aid. Food aid is mainly distributed to Internally Displaced Persons confined to camps in the war-ravaged areas of northern Uganda and people living with human immunodeficiency virus (HIV)/acquired immune deficiency syndrome (AIDS). Uganda is not a beneficiary of the Marrakesh Decision, as it is not a net fooddeficit importing country. In Uganda, poverty, more than anything else, is the cause of food insecurity. If the country can reduce its poverty by boosting household incomes, food insecurity will be reduced. Poverty reduction is a medium- to long-term proposition. In the short run, large numbers of Ugandans will remain malnourished or at nutritional risk, especially young children. Often food is available, but individuals do not have the economic ability to access it because of civil unrest and inaccessibility of productive resources. This implies that food insecurity is more of a demand than a supply problem, that is to say, not inadequate production but inadequate incomes. The poverty line is defined, based on the food poverty line. 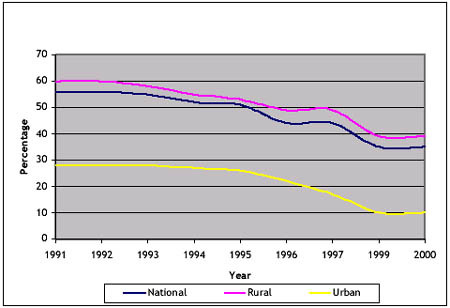 Data from household surveys show that poverty in Uganda declined from 56 percent in 1991 to 44 percent in 1995 and 35 percent in 2000, as shown on Figure 6. This implies that, in the year 2000, about 35 percent of Ugandans were poor and did not earn enough income to cover the cost of basic food and non-food items. The data also show that poverty is more prevalent in the rural areas than in the urban areas, with the north and eastern districts of Uganda being the most affected. Northern Uganda, which is war-ravaged, suffers from transitory food shortages. This region has also witnessed the least progress in poverty reduction, where rural incomes and consumption actually declined between 1997/1998 and 1999/2000. Both this internal civil unrest and conflicts in neighbouring countries have caused some 800 000-900 000 citizens to be displaced and relocated in protected camps, together with another 200 000 refugees. Under such conditions, farmers have little means to invest in improving agricultural production. Figure 6. Poverty in Uganda. HIV/AIDS is another factor undermining food security in Uganda. Approximately 1.8 million people are HIV-positive, and this epidemic has already resulted in 1.7 million orphans. Families that are affected by the epidemic suffer from productivity loss, which greatly increases the risk of food insecurity. Ugandas per capita income in 1990 stood at US$350, dropped to US$190 in 1994 and rose to US$290 in 2000. This implies that, in the year 2000, Ugandas per capita income was still below that of the year 1990. 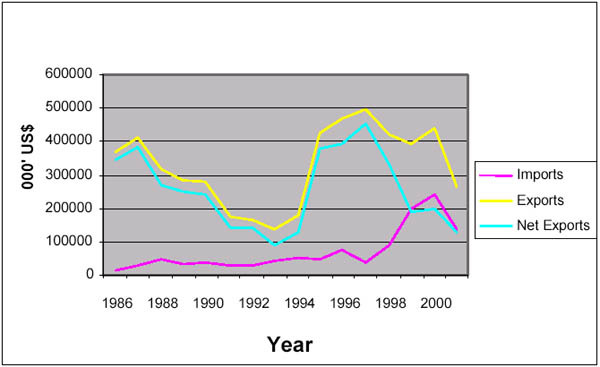 Gini coefficients for the period 1992-2000 show minimal changes in the distribution of income in Uganda, as shown in Figure 7. However, while the distribution of income in urban areas registered a slight improvement, in the rural areas the income gains accrued to very few households. Figure 7. Gini coefficients for Uganda. The rate of growth in the Consumer Price Index has been declining over the past decade. The period between 1991 and 1994 registered significant price inflation, with the headline inflation falling from 54.5 percent in 1992 to 5.1 percent in 1993. This was due to favourable weather conditions that resulted in a lower increase in food prices. In the last five years, headline inflation has remained at single-digit levels, with the highest rate at 8.2 percent in 1997 and the lowest at 0.1 percent in 1998. The higher headline inflation rate corresponded with the El Niño weather phenomenon, which led to poor agricultural performance. Malnutrition is still a problem in Uganda, since there are high levels of stuntedness, wasting and underweightness among children under five years of age. Table 13 shows that stuntedness and underweight decreased slowly from 44.5 percent and 23.3 percent in 1988 to 39.1 percent and 22.8 percent in 2000, respectively. However, the proportion of wasted children rose from 1.9 percent in 1988 to 4.1 percent in 2000. This implies that feeding and nutritional management is still a major problem in Uganda. Other factors that influence the health of children include poor living conditions and sanitation, as well as a heavy family burden. Diseases such as malaria, acute respiratory diseases and diarrhoea also impact negatively on childrens growth. Source: Uganda Bureau of Statistics. UDHS: Uganda Demographic and Health Survey. Ugandas position at the Doha ministerial conference is no different from that which it pushed for in the current AoA negotiations. Since the inception of the WTO, world trade has continued to expand. However, Africas share of world trade has diminished over the same period, a situation that is by no means acceptable and needs to be addressed. The Government of Uganda strongly believes that the current asymmetries in international trade pose a great challenge to the LDCs. It is from this viewpoint that Uganda calls for a reassessment and review of several aspects of the multilateral trading system. Negotiating for tariff reductions on value-added products. Ensuring that special and differential treatment continues to be an integral part of the AoA and structured in such a manner so as to respond to its development needs rather than being just a best endeavour. Protecting the trade preferences it enjoys under the Cotonou Agreement, the GSP, EBA and AGOA in a liberalized multilateral trading environment. It therefore seeks waivers for these initiatives and advocates bound duty-free, quota-free preferential treatment. Advocating special and differential treatment in respect of the SSG by seeking its modification because of its vulnerability and weakness as an LDC. The SSG will help Uganda because it is much easier to invoke compared with the ordinary safeguard, since it does not need proof of serious injury. Uganda supports the expansion of TRQs to accommodate larger quantities in the protected market as well as reform of TRQ administration, especially the allocation of export licences to various suppliers. The negotiations should bring in reforms in this system to simplify it and make it transparent. Agriculture is a way of life for the majority of the population in Uganda, and support to agricultural production is essential to ensure food security and alleviation of poverty. It employs over 70 percent of rural population and is a significant contributor to GDP as well as an important source of foreign exchange revenue. As regards food consumption, the sector accounts for a large share of expenditure out of total household income. Besides, it is not easy to provide alternative sources of employment for the rural poor in Uganda. It is imperative that ongoing trade negotiations on the Agreement on Agriculture do not undermine the viability of the agricultural sector in the multilateral trading system. The Blue and Green Box exemptions in practice set no limit to the level of domestic support provided by developed countries, despite the reduction commitments. Total OECD support for agriculture is US$362 billion annually, of which 90 percent is in the EU, United States and Japan. These figures compare poorly with total agricultural exports from developing countries of US$170 billion a year. Uganda urges the simplification and tightening of domestic support provisions, particularly on exempt policies, as this has greatly distorted the market for agricultural products to its disadvantage. It also urges that a monitoring mechanism be put in place to guarantee a phased withdrawal of domestic support by developed countries. Furthermore, Uganda joins the Cairns group and those members who are proposing a Development Box that would take care of the unique situation to do with employment, rural development and food security. In many cases, export subsidies have contributed to the displacement of exports from developing countries like Uganda within their domestic as well as regional markets. Export subsidies damage production of small-scale producers in the LDCs, who have meagre resources. Uganda therefore advocates the total elimination of these subsidies. There is a huge gap between LDCs and developed economies in technology innovation. Technology transfer is therefore seen as a means of increasing productive capacity and supply in LDCs. Hence, it is imperative that TRIPS promotes technological innovation, transfer and dissemination of technology for the mutual advantage of both producers and users in a manner conducive to social and economic welfare and to the balance of rights and obligations. Uganda is of the view that Article 66.2, which is mandatory, should be made operational. Uganda adopts the view that the TRIPS agreement contravenes the basic tenet on which patent laws are based and raises ethical, religious and cultural questions. These questions have an impact on national aspirations and goals of food security and health. These also impact on local communities whose traditional knowledge has produced staple varieties that have medicinal and biodiversity values. Hence, Uganda advocates a substantial review of Article 27.3(b) with a view to ensuring that natural life forms are not patented, genetic resources are accessed on mutually agreed terms, and the sui generis system envisaged therein is made consistent with the Convention on Biodiversity. Uganda and civil society perceive the TRIPS agreement as undermining the legitimate right of WTO members to formulate policies that protect public health. In this respect, Uganda strongly believes that the TRIPS agreement should provide the widest flexibility to member countries to address emergency public health crises and concerns such as HIV/AIDS, malaria, meningitis, tuberculosis and other diseases that commonly afflict its population. Trade in services is absolutely important to Uganda because the services sector has continued to grow while facilitating numerous other areas of the economy. Furthermore, the services sector is contributing significantly to Ugandas foreign exchange earnings. It is imperative, therefore, that the focus of the ongoing GATS negotiations be directed towards further development of the services sector in developing countries. GATS exempts LDCs from fully liberalizing their service sector, and thus they have the flexibility to liberalize selected sectors. However, Uganda is advocating a revisit of the provisions relating to mode 4 supply referring to the movement of natural persons. It advocates that developed countries relax their immigration and visa requirements to allow easy movement of natural persons across their borders. Uganda agrees with the view that New Issues should be subject to further study, and those not found to be of trade concern should not be included in the trade rules. Uganda believes that the inclusion of new issues in the WTO negotiations will overload the agenda and add to the burden of obligations and the associated problems of implementation for the less advantaged members. Moreover, the proposals from the proponents of the new issues and the implication of their inclusion are not clear. Uganda is of the strong view that any future work in WTO must contain a development component. enhancing Ugandas capacity to take advantage of the Agreements through improved export readiness. Although the country has received technical assistance to help integrate it into the multilateral trading system and has taken some steps to improve its trade position, there a coordinated approach to integrate trade within Ugandas national development policy framework is lacking. A number of gaps to analyse the effects and contributions of the multilateral trading system on Ugandas economy and capacities to negotiate and participate effectively in trade negotiations still remain. Study prepared for FAO by Paul Wagubi, Trade Specialist, Uganda. Dumping is defined as exporting goods at lower than the fair market price in an exporting country. The fair market price, in turn, is determined on the basis of (1) the home market price or, in the absence of such a price, (2) the export price of identical or comparable goods or (3) the actual or estimated cost of production (with additions for selling cost and profit). Subsidies are defined as direct or indirect support for the production or export of goods, whether through grants, loans or tax relief. The investigation is to be carried out by the Commissioner-General of Customs.